DRB Hicom denied the plan to rebadge VW Polo. It is a false news reported by local newspaper. Read full news below. DRB-Hicom Bhd has denied the company will rebadge Volkswagen Polo to replace Proton Saga as reported by some local newspapers. Group managing director Datuk Seri Mohd Khamil Jamil said the company has no plan to rebadge its cars. He said the news reports surprised him, adding that the information did not originate from DRB-Hicom. A Proton Saga Replacement from rebadged Volkswagen Polo Sedan at around RM70k? Local news reported that VW interested in converting VW Polo to replace Proton Saga with a lower spec than the current VW Polo to lower down the price but in my opinion, it is still not worth with that price tag of Proton Saga Replacement. The current model has made a big success for Proton and they don’t need any other car to be rebadged. The current model has the potential to be enhanced and better than the Polo in terms of comfort, ride, handling, space, features, engine and exterior with more value for money spec. Read further news below. 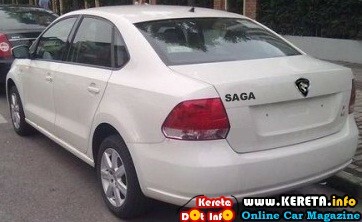 REBADGE VW POLO SEDAN AS PROTON SAGA REPLACEMENT? A plan to rebadge the Volkswagen Polo compact car as a Proton Saga replacement would be a positive move for Proton Holdings Bhd and the domestic automotive parts sector, said research analysts. OSK Research said in a report that this could help the national carmaker recapture market share and benefit the local automotive component makers in the event that the rebadged Polo result in huge production volumes catering to the export market. “We see this rebadging possibly materialising in one to two years, given that the present Proton Saga is nearing the end of its life cycle.” A local business daily reported that Volkswagen was looking into the possibility of rebadging a Polo model as a Proton Saga replacement via a tie-up with DRB-Hicom Bhd. The report said a locally-produced Polo might be priced below RM70,000. At present the imported 1.2-litre turbocharged Volkswagen Polo TSI is priced at RM113,888 in the peninsula. In January, DRB-Hicom Bhd had won the bid to buy Proton’s 42.7% equity stake held by Khazanah Nasional Bhd for RM1.29bil or RM5.50 per share. DRB-Hicom will undertake a general offer to minority shareholders at RM5.50 per share to acquire the remaining shares it does not own in a bid to privatise the national carmaker. The present generation Saga was introduced in 2008. Another motor analyst concurred, and said that Volkswagen wanted a bigger market presence in Asean, and Malaysia had been a potential Asean manufacturing hub for the German carmaker for a long time. “A rebadged Polo could provide Volkswagen with a significant presence in the entry-level passenger car segment in Asean markets.” However, one motor analyst pointed out that there was no guarantee that the rebadged Polo would be well-received by car buyers.